Specifications: 1. Color: Black + Red 2. Reflector: Flat Lens 3. Material: Aluminum alloy + Plastic 4. Model of LED: CREE XML T6 5. Switch: End-cap press ON/OFF 6. 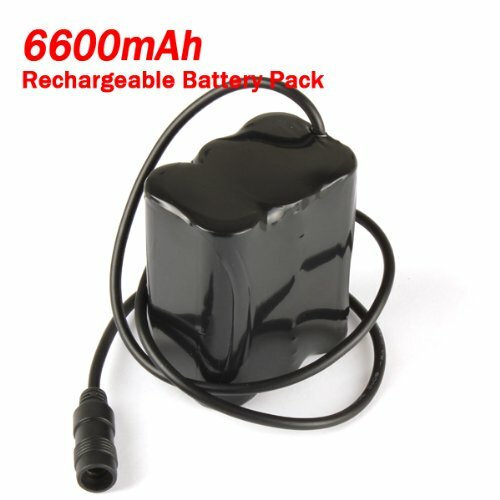 Battery: Rechargeable Li-ion battery pack included 7. Input: 100V-240V, 50/60Hz 8. Output: 4.2V DC/1.A 9. Plug: US 10. Aluminum alloy casing, waterproof design, long service life. 11. Equipped with an elastic & adjustable headlamp band and 2 plastic rings, very convenient. 12. Suitable for cycling, climbing, fishing, hunting, camping and other outdoor activities. 13. 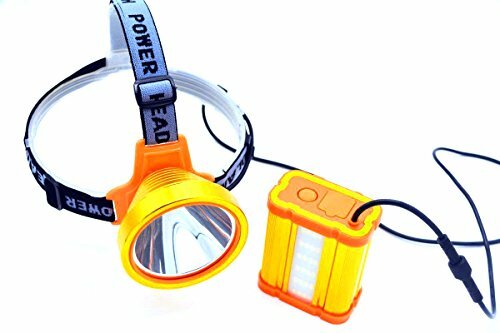 HeadLamp size: 4.2 * 5.8cm(D*H) (1.6 * 2.28in) 14. HeadLamp weight: 112g / 4.0oz 15. Package size: 23.5* 7.5 * 7.5cm (9.3 * 3.0 * 3.0in) 16. Package weight: 480g / 16.9oz Package includes: 1 * CREE XML T6 HeadLight 1 * HeadLight Band 1 * Battery pack 1 * Power Charger 2 * Rubber rings for installation Please note:Sold only by Onedayshop,Onedayshop company never sold these items to other vendors, be careful! Our products have been tested, if any problem, please contact us at the first time so that we can supply the best service for you. Long lasting and high-capacity battery for those long rides. 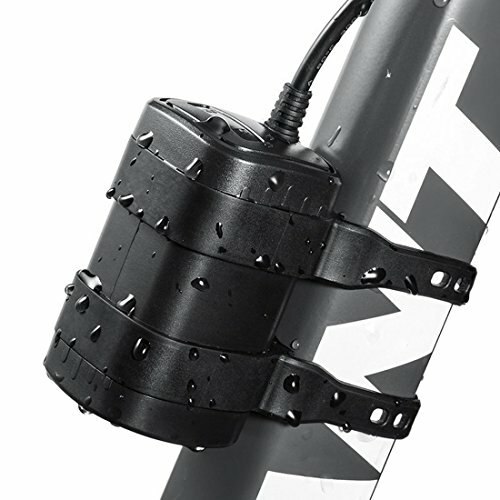 Reliable Rock-Solid water & shock proof system for any conditions you meet outdoors.Waterproof rating is IPX-5.The battery secures to your bike using two robust rubber bands which means it stays in place no matter how rough the terrain. 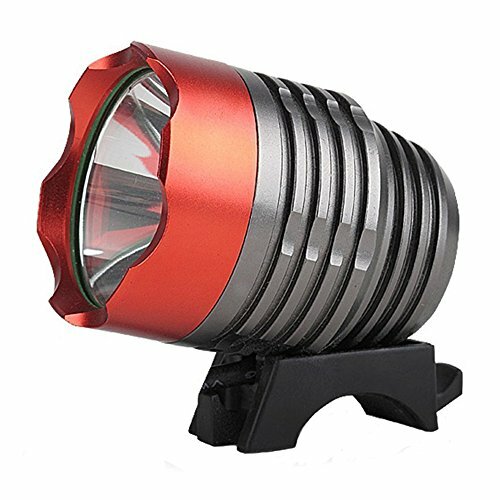 Comunite 1200 Lumens Super Bright Cree Xlm LED Flashlight Bike light Headlamp Flashlight with 5200mah Battery Pack, for Camping,Hiking and So On. 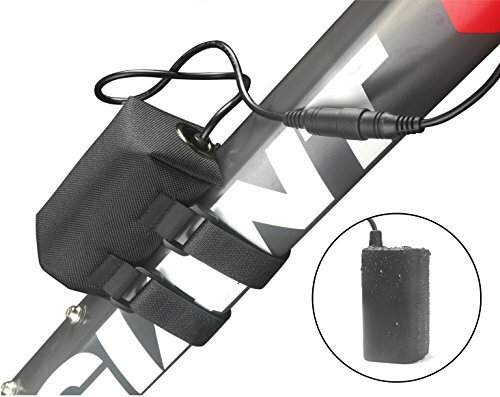 - Fits great on handlebars with easy rubber mounts - 4 x 18650 5200mAh, the External Battery Where it is Most Convenient With the Long Headlight and Battery Cords Provided. Li-ion Battery pack,long run time(54hrs MAX) - Up to 3.5 hours on high and up to 25 hours on low. Intelligeng circuit control and flexible gear alter.Three gears/five gears dimming memory circuit - High mode with a powerful 1200 Lumens, Medium mode = 900 Lumens and BRIGHT Strobe mode. -Press the power key for 3 seconds when start up.The twice fast flash of the red light can realize switching between three gears and five gears.When the light is working,long press the power key can turn it off. New start up remembers the gear of last power off WHAT CONTENTS IN THE BOX - 1 x LED Bike Headlight - 1 x Battery Pack with Pouch - 1 x Power Adapter - 2 x Heavy-duty O-rings for easy headlight mounting - 1x 5200mAh Lithium Ion Rechargeable and waterproof Battery Pack with Pouch - 1x FREE BONUS Head harness that the light attaches to, for RUNNERS, HIKERS AND CAMPERS...etc. 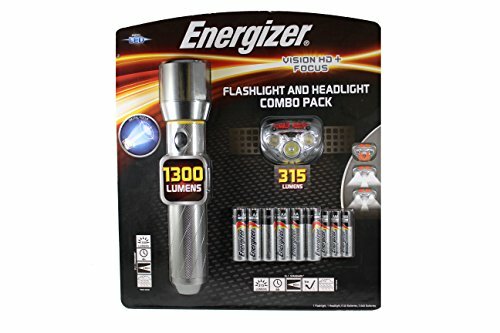 The Energizer Vision HD+ Focus Headlamp features five light modes for a variety of tasks. The digital focus feature allows a gradual transition from full spot to full flood light and memory recall allows the light to return to its last focus setting. 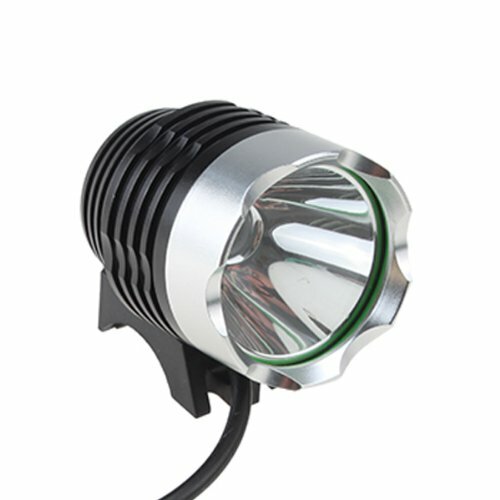 Access the white light in the form of high, low, spot, and flood light; alternately turn on the red night vision with the push button switch. The powerful beam is up to 4X brighter than standard LED technology. The Headlamp's LEDs provide an impressive maximum output of 250 lumens of bright white light and reach a distance of 80 meters. ❤ EverBrite carries on product quality, innovation, value and customer satisfaction of dedication. We will with unrivalled ability, meet the unique requirements of customers in terms of recognition and lighting. 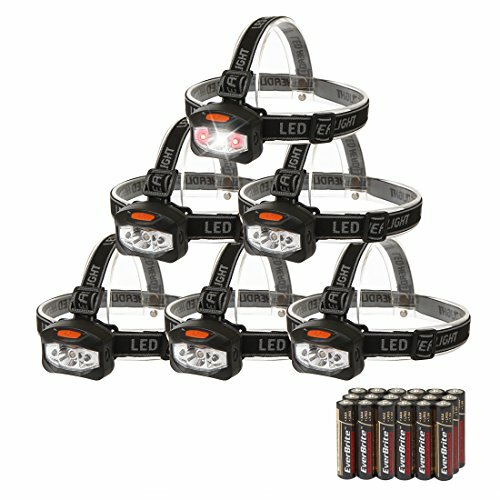 6 pack led headlamps for camping reading including black headlamp 18 batteries. ❤ Specifications: - Lumen: 120 Lumen - Strap Dimensions : 0.87inches width and 23.6 length - Product Dimensions: 3.1 x 2.4 x 1.8 inches - Color: Black - Type of Bulb: LED - Batteries: 18* AAA batteries required. (included) ❤ WARNINGS:If your flashlights are used infrequently,such as once a month or less, it's recommend to remove the batteries and store them separately.This helps guard against corrosion and may also prolong batteries life. 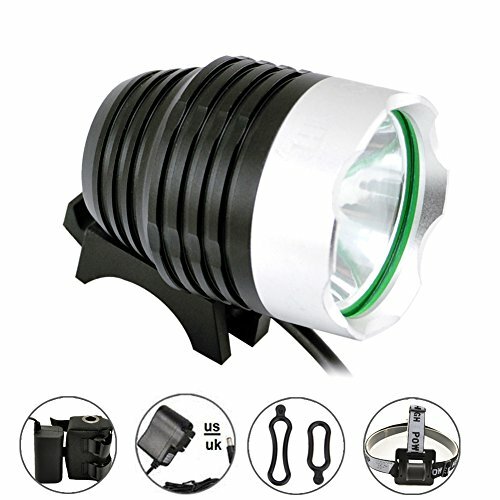 Working Time: - Can work 3 ~ 4 hours (in the middle mode for 1X CREE XM-L T6 LED) - Can work 1.5 ~ 2 hours(in the middle mode for 3X CREE XM-L T6 LED) Weight: 280g Dimension(L x W x D): 65mm x 56mm x 36mm What's In The Box: 1 x 6600mAh Rechargeable Battery Pack ePathDirect After Service: 30 Days Money Back Guarantee, 12 Months Warranty! dirtbike lights without having a battery! 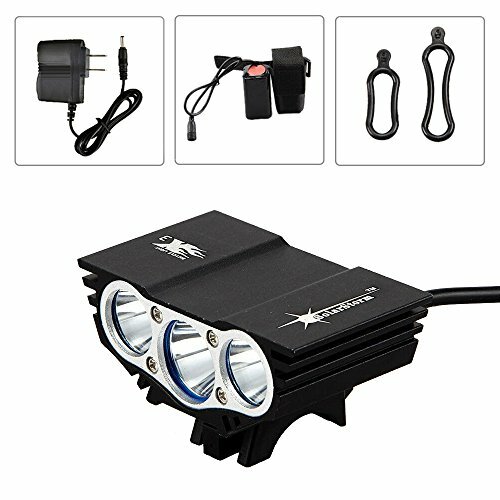 Compare prices on Headlight With Battery Pack at ShoppinGent.com – use promo codes and coupons for best offers and deals. Start smart buying with ShoppinGent.com right now and choose your golden price on every purchase.